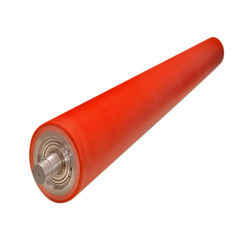 This Bridle Roller is made of quality material and is used in metal sheet industry. With honest intentions to improve the standing we have earned in this arena, we are offering a distinct collection of Bridle Gear Unit. 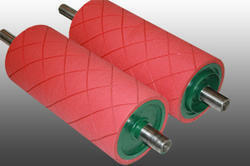 Our Bridle Rollers are designed in special high load bearing elatomers. With hardness of 85-90 Shore A, these Bridle Rollers ensures seamless and continuous working. Further these Rollers are oil resistant to protect the covering with any oil contact that may come. Assisted ourselves with skillful personnel, we are immersed towards presenting to our customers an enormous consignment of Bridle Roll. Being the most respected organization guided by experienced and knowledgeable professionals, we provide an enormous assortment of Bridle Rolls. Hot Bridle Rolls are the key to maintain optimum tension of the strips during operation. UNI Abex offers these rollers as per your specification, with large diameters and suitable machining. Avail from us a wide range of Hot Bridle Rolls, which are in tune with the prevailing trends of requisite industry. Offered bridle rolls are flawless as these are manufactured by making use of high grade raw material and modern machinery at our technically advance infrastructure under the presence of experts.